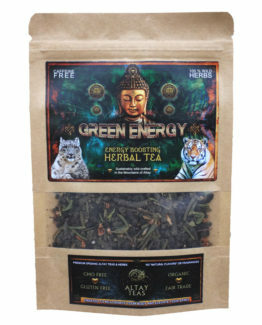 This ancient herbal blend is one of the most ancient teas known in Altay. 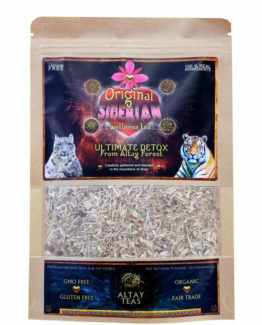 It has been used by Altay people for centuries to normalize sugar and lipid metabolism, and to support digestion. 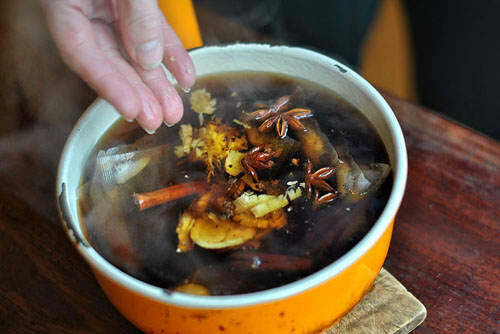 It’s known for improving liver function, helping clean kidneys and strengthening the gall bladder. 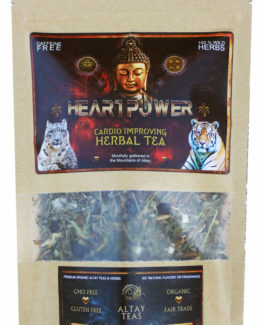 Commonly used to support cardiovascular system, stabilize blood pressure, improve overall blood flow, and to fight atherosclerosis. Known to make blood vessel walls stronger and more flexible, while cleaning it from cholesterol deposits. It’s also famous for being very soothing for the nervous system and as a great helper in case of neurosis, stress, and anxiety. 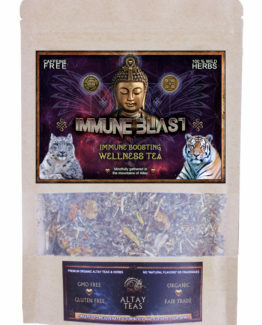 It’s praised for its strong antibacterial effects, high vitamin count, immune system support, and as a great defense from cold and viral infections. Often used in cancer therapy, for easing allergies and for restoring body water retention balance. It’s proven to be very useful for balancing hormones, and strengthening the bone tissue, while improving overall functioning of the brain. VITAMIN TORNADO IN ONE CUP! Hepatitis, Pregnancy, Lactation, Individual intolerance. Not recommended for children. 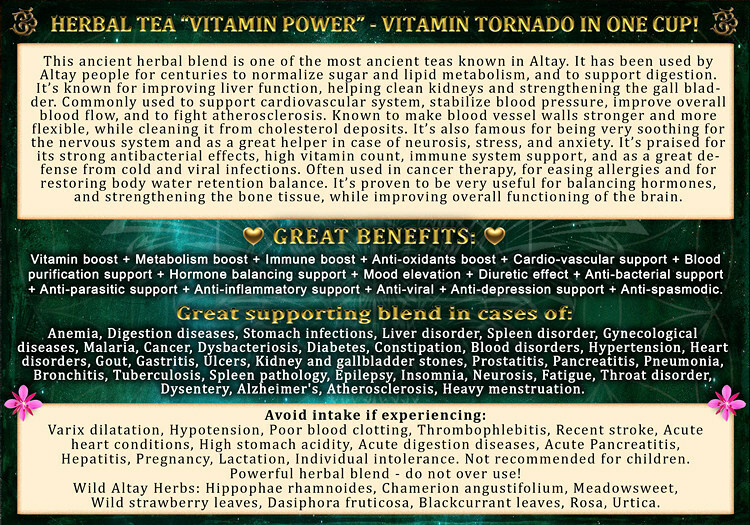 Powerful herbal blend – do not over use! Wild Altay Herbs: Hippophae rhamnoides, Chamerion angustifolium, Meadowsweet, Wild strawberry leaves, Dasiphora fruticosa, Blackcurrant leaves, Rosa, Urtica. 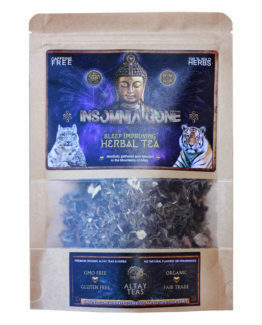 ← New Tea in Stock! 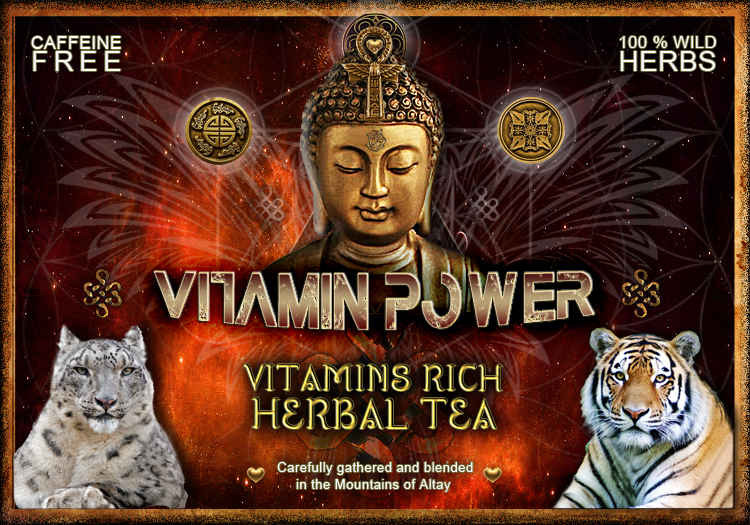 – “ProductiviTea” – Unleashed Creativity!